Anna Bohman Gallery is pleased to announce the exhibition "Dagen Etter." Curated by the Norwegian artist Bjarne Melgaard and curator/publisher Elise By Olsen, "Dagen Etter" presents three young Scandinavian artists: Lasse Hieronymus Bo, Matias Kiil and Eirik Sæther. The exhibition reflects society's need to make life appear carefree and pretty, notwithstanding that many are struggling. As people strive to stage an image of perfection outwards, the reality of existence is often inhuman and grotesque. Creating a background for the exhibition, Bjarne Melgaard has produced a wallpaper showing Ronald Poppo`s half eaten face. As a contrast, Melgaard has also produced a more congenial wall-paper for his exhibition at the Market Art Fair, portraying himself and his partner. The two wallpapers illustrate the contrast between mundane triviality and horror, and that even if we in our time consume more art, fashion, press, technology and social media than ever before, we are still left with a sense of a chronical hangover and a growing feeling of emptiness. This exhibition opens a dialogue with Melgaard´s solo-exhibition for Galleri Bohman-Knäpper at the Market Art Fair (https://marketartfair.com/exhibitors/bohman-knapper/), the thought being that the two presentations highlight the thematics of "Dagen Etter." LASSE HIERONYMUS BO (b. 1994, Copenhagen, Denmark) is an art student at Kunstakademiet, Institutt For Samtidskunst, Bergen, Norway. In his artistic practice, Hieronymus Bo seeks to question the physical presence of his work. He uses certain techniques to make the materials he uses change appearance into something else. He makes these techniques visible as they operate as a decision linked to the concept of the work. The idea is to state that it is not about obtaining a visual effect, but to present the idea of the manipulation and a narrative within it. The result shows a fragility of the subject that often points at monumentalism and architecture, as well as the gallery space from an institutional point of view. For the exhibition "Dagen Etter," Hieronymus is showing a site-specific installation and three wall pieces. The installation consists of fragmented pieces of stucco cut from foam. Mounted on hollow steel grids protruding from the walls, it is possible to see the backside of the fragments, thus revealing the porous materials. The series of wall pieces consists of photos of smashed store windows printed on plexiglass panels. With acrylic sealant applied in an expressive style on the backside of the glass suggesting a temporary repair job, the artist recreates these incidents as painterly gesticulations. MATIAS KIIL (b. 1995, Stavanger, Norway) is an Oslo based artist and works with sculpture, installation and text. Kiil has an interest in automated norms and gestures in contemporary culture. He explores movement and language in the social, the political and the spiritual. With an assemblage approach, he combines everyday objects with traditional materials and techniques. Holding On (2019) is a series of three sculptures commissioned for the exhibition. The series portrays hands in various positions connected to holding. 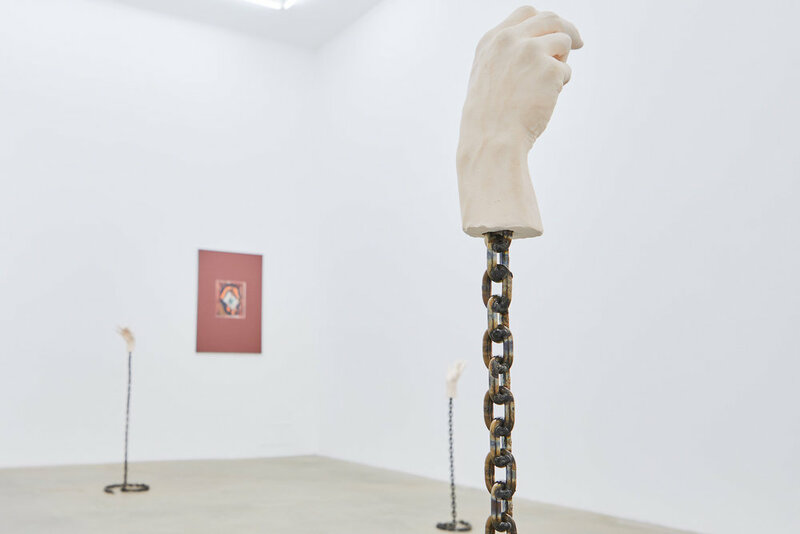 Holding On consists of hands cast in plaster mounted on welded chains. The work explores topics of gravity, duality, isolation, presentation and possession and show an impossible state in terms of physics Kiil reflects upon sustainability and our striving for the perfect and our desire for a more substantive mental state and physical environment. EIRIK SÆTHER (b. 1983, Halden, Norway) graduated from Oslo Academy of the Arts' MFA program in 2010 and is based in Oslo. With the video contribution "Bubbles", Sæther presents a complex picture of the authorative symptoms of our time, our elusive relation to traditions and the relationship between the generations. The recital anchors the event in something constructive and manifests a will to context even under straining circumstances - and by doing so a conservation of the father-son relation - regardless of how undeserved it might be. Through recognizable roles and familiar archetypes, Sæther invites the audience of "Father's Figure" into a staged world with ambivalence in all parts of the production. The disturbing duality tends to evoke both laughter and discomfort and opens for reflections on our own experiences in the gloomy surroundings. The artist conjures a dark world that creates associations from townships to favelas and hotel rooms and design interior, which in sum exhibits a dissolving and collapsing reality. The installation consists of different elements and techniques, from video to ceramics.